A group of atomic researchers, Science Associates, is being decimated by remote control. The survivors suspect that the villain, calling himself "Dr. Vulcan", is one of themselves, bent on a monopoly of their technological wonders. Jeff King (Tristram Coffin) is assigned to safeguard the group's secrets. For a professor he's very handy with his fists and has the added advantage of a secret, experimental rocket suit that enables him to fly. But Dr. Vulcan has deadly devices also. 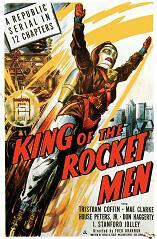 Can the Rocket Man expose Vulcan without revealing his own identity?